India is as much known for Yoga & Meditation, as it is known for its Taj Mahal and tigers of Ranthambore. The Beatles’ trip to Rishikesh with Maharishi Mahesh Yogi in 1969 is a very famous example to showcase the weight India carries in a world which is concerned not only about its mental and physical fitness but also about its spiritual growth and development. The celebrities of modern times, such as Mia Farrow, Steve Jobs, and Oprah also flocked to Indian Yoga and meditation retreats looking to immerse in their tranquility and change their lives forever. In November 2013, the British royal couple – Prince Charles and Camilla Duchess of Cornwall – spent time in an ashram in Rishikesh too. Wellness travel includes Yoga and meditation as well as spa and massage experiences to reduce one’s stress and improve one’s health holistically. India is a natural choice for wellness travel because it is a leader in Ayurveda, Yoga, and Meditation. Unsurprisingly, it is one of the fastest-growing wellness destinations of the world – with a projected growth rate of 22% per annum. The US, which is the leading destination for wellness tourism right now, has a projected growth rate of 5.8% per annum on an average. The popularity of Yoga is evident with the fact that when the UN passed the resolution of celebration June 21 as the World Yoga Day in December 2014, all 193 countries of the world passed it unanimously, and as many as 177 countries co-sponsored it. Tourism in India has been rising steadily since the 2002 ‘Incredible India’ ad campaign, which targeted higher-yield (read ‘wealthier’) tourists. From low-cost ashrams to a multiple-star meditation retreats, India’s holy cities promise what everyone wants today – thousands of years old recipes for eternal youth. The maiden International Yoga Day celebrated at Rajpath last year had set two Guinness World Records in a day. 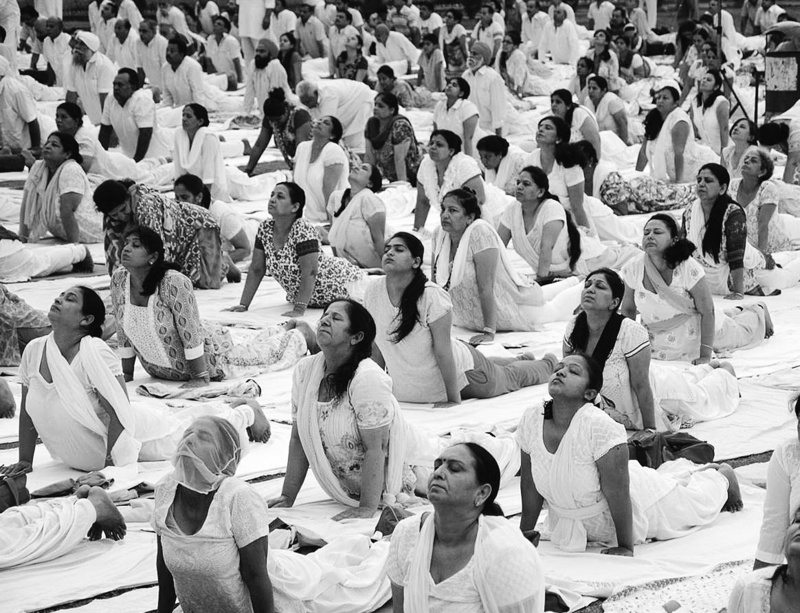 The mega event broke the record for the largest yoga class ever, with 35,985 participants. It also holds the record for the yoga event with most globally diverse participants. People from as many as 84 different countries had participated in it. Ministry of Ayush and the Tourism Ministry are promoting India as a ‘Yoga Tourism’ hub, where people can come to heal their bodies and calm their minds. Their catch-phrase is ‘India, Land of Yoga’. It is also being linked to the medical tourism in India and appeals to people to opt for holistic health solutions. Government of India gives out a list of authentic Yoga institutes as well as the publicity material with yoga postures, which are distributed to the public through the Ministry of Tourism centres internationally. Government of India is also giving tourist visas and e-tourist visas to foreigners who want to pursue short term courses in Yoga in India along with short duration medical treatment under Indian systems of medicine, recreation, sightseeing, and casual visits for business or to meet friends. People from 150 countries can avail the benefit of e-tourist visas at as many as 16 Indian airports. It means that they can travel to India with the printout of an email approval of their visa application, and get it stamped at the time of entry into the country. India also offers visa-on-arrival facility to the Japanese – which has a validity of 30 days. It is also making efforts to attract travelers for Yoga, which holds the promise of self-realisation. To do this, it is identifying yoga centres across the country, and linking them up with tour operators. The emphasis is also on developing physical structure and skill sets (with the help of state governments) that can make these centres more attractive to foreign tourists – such as ability to handle visitors, and language orientation. Social media and public platforms will also be used to market yoga better. Subhas Goyal, President of the Indian Association of Tour Operators, said on the occasion, "This is a good start. Yoga is popular across the world and the demand for yoga tours is increasing. It is a good thing that the government has taken an initiative in this regard." For thousands of years, Yoga has been practiced in India to promote physical and mental fitness, as well as aid in spiritual growth and development. The government hopes to revive this ancient Indian technique that can positively impact the health of Indians. The HRD Ministry has asked schools to include ‘yoga’ in its curriculum – as a daily practice. Besides instant gratification, Yoga offers lasting transformation too – which is why most people who come to India to practice Yoga return to the country again and again to learn more about it. When we package yoga tours, we have to keep in mind that both are equally important. Too much time with too few results can be discouraging for tourists. To grab their attention, we have to make them aware about yoga’s long-term health benefits as well as to incorporate exercises and practices that can showcase quick results. Yoga Tourism opens up tremendous opportunities as it is for everyone. People of all generations and fitness levels can find classes suitable for them. In the modern yoga studios, you can see rooms full of bubbly children and teenagers, fitness freaks, body builders, athletes, middle-aged housewives, and the elderly as well. Unlike other sports or activity classes, yoga is all-inclusive. The practice of Yoga also helps one to achieve peace and tranquility through focused training. At the time when job responsibilities, kids’ needs, spouse’s demands, and never-ending to-do lists can easily overwhelm us, yoga teaches us to relax, de-clutter our minds, and create a space for ourselves where we can be happy and at peace with ourselves. There are many forms of ‘yoga’ one can pursue, depending on one’s preferences and lifestyles. There is relaxation yoga where breathing exercises and meditation techniques are stressed upon; there is hot yoga or Bikram Yoga to eliminate toxins from your body by doing exercises in a hot room; there is power yoga for those who are looking to increase their body’s stamina and resistance power; there is prenatal yoga for pregnant women, and there is Hatha Yoga for beginners who want to learn basic postures at a comfortable pace. No matter, what your fat percentage, fitness level or health history is, you can always learn and practice Yoga. It means that there is no limit to the clientele Yoga tour operators may get. How to benefit from the Yoga Tourism trend? We need to remember that 'Yoga' for Indians and 'Yoga' for foreigners is not the same thing. Many American yoga students, for example, are fiercely independent and self-reliant. For some, yoga is a not-too-strenuous way to lose fat effectively, or reduce their stress. For others, yoga might mean doing strenuous postures to become more flexible, firm up their abs, or attain slender muscularity. Others might be looking for ways to reverse the onset of lifestyle diseases like diabetes and arthritis. This commodification of 'Yoga' is crucial today, if you want to earn from it. June 21 has created an opportunity for the entire Indian travel and tourism fraternity to boost inbound tourism to the country. Yoga tours are already being conducted regularly, with clientele from France, USA, Germany, Russia, and several other countries. With the World Yoga Day branding, the Yoga is now known all over the world, and the niche tourism products in the field with dedicated Yoga packages are bound to do well in such a scenario. Yoga tourism is not only good for ashram services sector but also for hospitality sector in general. Anuj Singhal from Mauritius Tourism revealed that most of their clients who come to India for Yoga experience stay for a longer period. They demand for high-quality guest houses or serviced apartments too. Besides foreign tourists, corporate houses and companies from India and abroad popularly opt for Yoga sessions for their employees as offsite training programmes. It presents several more opportunities for those who are working for the tourism industry. Here is a word of caution though. Despite all the branding and marketing efforts, Yoga tourism can only pick up when we offer quality to the tourists. Many other countries are looking to cash-in on the hot new trend. Bali island of Indonesia, is a popular destination for Yoga. Thailand, Laos, and Cambodia are some other popular destinations for Yoga World Tours. Japan offers a ‘Hot Spring Yoga’ tour while Morocco, Turkey, Fiji, China and Sri Lanka are competing for attention in the Yoga world circuit too. India has an edge over other countries because the trips to India are moderately priced and offer several budget options too. It is also believed to be the country where roots of Yoga lie. If you can build upon this premise, and offer world-class services and real results to wellness tourists, you are bound to do well as Yoga tourism operator, trainer or service provider. Offer Yoga packages that can double up as spiritual tours, visit to Taj Mahal, Indian experience tours, and adventure tours, and you will have more chances of making it big in the industry.